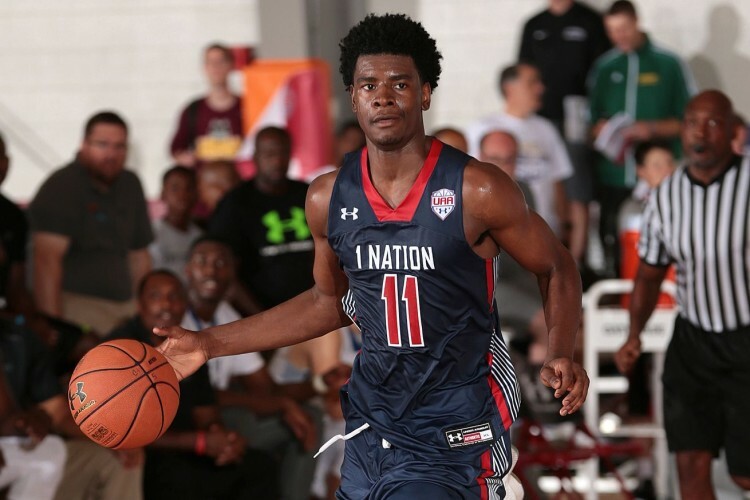 ​​LAWRENCE, Kansas - As StraightHoops first reported via Twitter on March 31st, 2016, five star SF Josh Jackson is headed to Kansas. He made it official tonight, sending the Rock Chalk fan base into a complete frenzy. And the mass hysteria is for good reason. Jackson, a 6'7" wing out of Prolific Prep (CA) via Southfield, Michigan, is a special talent. The McDonald's All American Game co-MVP combines athleticism, speed, and power, with an uncanny ability to do just about everything on a basketball court. Jackson can attack the rim savagely, or step back and drill a 23-footer. He can defend the post, and the perimeter, and possesses instinctive shot blocking skills to go along with his nose for rebounds. He handles the ball like a guard and can just as easily take his man off of the dribble as he can dunk right over him. He facilitates as good as any 6'7" wing we have seen in sometime. It is no wonder why every major program in the country was, at some point, after this young man. Luckily for Coach Bill Self and the Jayhawks, Josh Jackson chose Lawrence, Kansas as his landing ground. Now that Jackson has committed to KU, the next question is, how well will he fit in with next season's Jayhawk roster? The answer to that is easy - perfectly. Following a season that saw Kansas go 33-5 enroute to another Big 12 regular season title and a Big 12 Conference Tournament championship, the Jayhawks fell short of their ultimate goal of a national title by falling to the eventual champions, the Villanova Wildcats, in the Elite Eight. That loss then saw a mass exodus from Lawrence with seniors Perry Ellis, Jamari Traylor and Hunter Mickelson set to graduate, and with underclassmen Wayne Selden, Cheick Diallo and Brannen Greene declaring early for the NBA Draft. And while Coach Self does have 6'11" Udoka Azubuike and 6'8" Mitch Lightfoot joining the team next season as incoming freshman, the 2016 recruiting trail, before today, had not been his best work. Jackson now adds that ever so important wing element back into the Jayhawks' rotation. It also adds another preeminent scorer into the lineup to go along with the returning backcourt of Frank Mason, III and Devonte' Graham. Remember, in losing Ellis and Selden, Kansas loses 30.7 ppg. While Mason and Graham will both increase production next season, Jackson has the ability to assume a lot of the scoring burden. If Kansas can also add uncommitted five star recruit Terrance Ferguson to the 2016 class, you can bet that KU will be right back in the national championship race next season. So why Kansas you might ask? Well, why not? Kansas is one of the premier programs in the country, a true blue blood that is in the national championship hunt each and every year. Oh, and Coach Self has a pretty good track record of not only putting super talents - like Josh Jackson - into the NBA, but into the 1st Round of the NBA Draft, which means guaranteed money. Andrew Wiggins, Kelly Oubre, Ben McLemore, and Joel Embiid, ring a bell? Add into the mix that Jackson will step right into a situation where he will be the man, so to speak, from day #1 at a program that is in the national spotlight 24/7, along with the fact that Phog Allen Fieldhouse may be the most exciting place to play college basketball on the planet, and yeah, it is a good fit for Mr. Jackson. A better fit than a place like Michigan State - another school on Jackson's short list - where the wing position may have been a little clogged next season with the likes of Miles Bridges, Josh Langford and Nick Ward all due on campus. At the end of the day, Josh Jackson's decision, like it should, came down to the best situation for him. He did not let any outside pressures or influences sway him one bit. There is no doubt that he possesses the talent to one day play in the NBA. Whether that will be in one year or three is up to Josh Jackson, and will depend on his work ethic and his abilities to progress over next season. And, like it or not, it will also depend upon his college situation: his level of competition, his exposure, his ability to play his game and create, and his willingness to embrace a role that will enable him to thrive within a program, will all be determinative factors. Josh Jackson decided that those factors will be enhanced at Kansas. Whether he's right or not we will see, but it will sure be fun to watch. Good luck, and congratulations, Rock Chalk Nation.